Thanks to the Gulf Oil Ford GT40 MKIs MKII historic triumph at the 1968 24 Hours of Le Mans we'll probably forever pay tribute to the light blue and orange colors. First it was the GT40 replicar paying homage and now, 40 years after the initial victory, the 2008 Aston Martin DBR9 will carry the Gulf Oil livery into battle once more to vanquish any foes trying to recapture the GT1 title at this year's 24 Hours of Le Mans. If a racing Aston is a bit out of your price range, may we suggest the Gulf Oil Bass? Full press release below the jump. Aston Martin Racing will return to Le Mans in 2008 to defend its GT1 title in the distinctive blue and orange livery of Gulf Oil. Two Aston Martin DBR9s will look to emulate Gulf's first victory at the 24 hour race 40 years on. Alain Dujean, Gulf Oil vice president international, said: "This is arguably the most important year ever for Gulf in motorsport. The famous Gulf racing colours first tasted victory at Le Mans in 1968, so 2008 already had great significance for us, but for Gulf to have joined up with Aston Martin Racing for this year is fantastic - the coming together of two great automotive names, for what I hope will be a long and fruitful partnership." David Richards, chairman of Aston Martin, said: "Endurance racing is engrained in the heritage of both Gulf and Aston Martin and we have also both been intrinsically linked through Le Mans for many decades. It was perhaps destined that, in the year we defend our GT1 title and Gulf celebrates the 40th anniversary of its win, we would finally race together at La Sarthe." 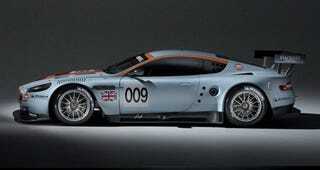 The two Aston Martin DBR9s for 2008 will be entered as numbers 007 and 009.